A perfect vegetarian/vegan recipe: soft potato and pumpkin cubes in a deliciously spicy coconut milk sauce. This is one of my favorite meals this time of the year. Either as a vegetarian or vegan main dish with just some salad on the side or as a side dish for grilled or baked chicken breasts, fish or even sausages. 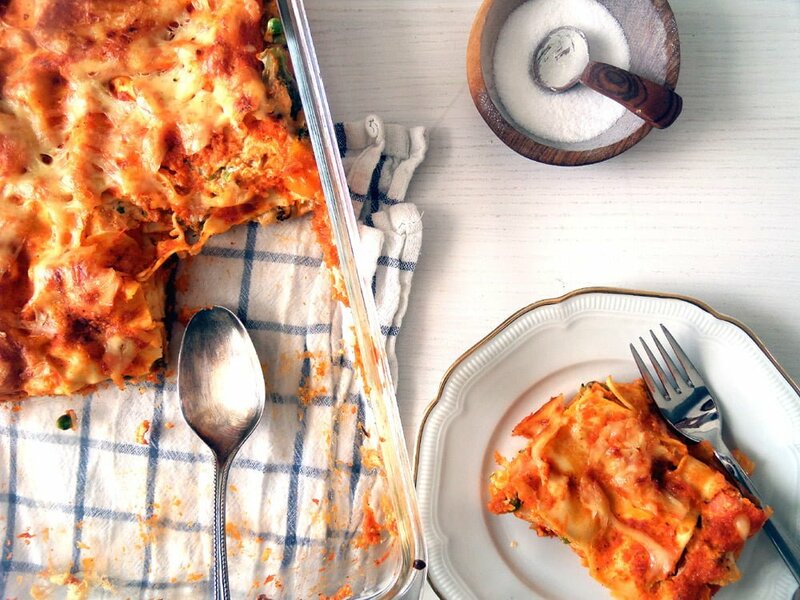 Everybody in our house loves this casserole: it is so soft, almost creamy and comfortable, a total delight. The short list of ingredients, its cheapness and the little effort involved in cooking this casserole, makes it even more appealing. Just a little bit of peeling and chopping, stir together a couple of things and you’re done. The rest of the work is done by your oven, you will not even have to stir in between. And if you’re using a Hokkaido pumpkin, you will even be able to skip the rather laborious task of peeling a pumpkin. Preheat the oven to 200 degrees Celsius/ 390 degrees Fahrenheit. Grease the casserole form with a little bit of butter or the vegan alternative. Peel the potatoes and cut them into cubes. Cut the pumpkin into similar sized cubes (if using Hokkaido pumpkin there will be no need to peel it). 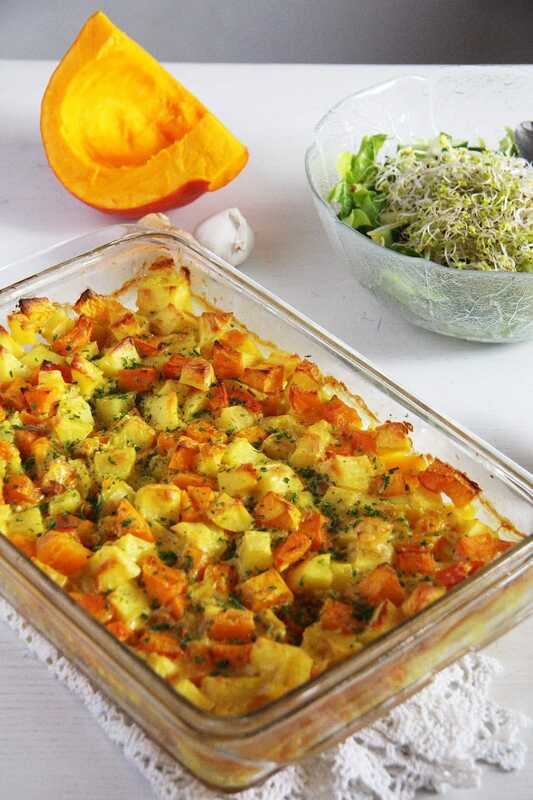 Give the vegetables into the casserole form, add salt and pepper to taste and mix with your hands. Top and tail the lemon grass sticks and remove their outer leaves. Chop them very very finely. Peel and grate the ginger. Remove the seeds of the chili (or leave them there if you like things hot) and chop the chili very finely. Place all these ingredients in a bowl and stir in the coconut milk. 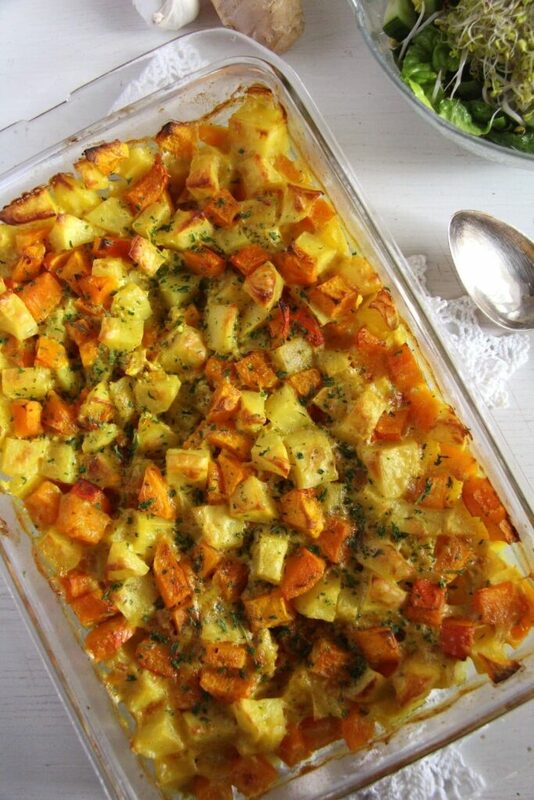 Pour this mixture over the potatoes and pumpkin, dot with the remaining butter or vegan alternative and bake for 40 or 50 minutes until the potatoes and the pumpkin are very tender. Sprinkle with parsley. Serve with salad or as a side dish for chicken or fish, for instance. 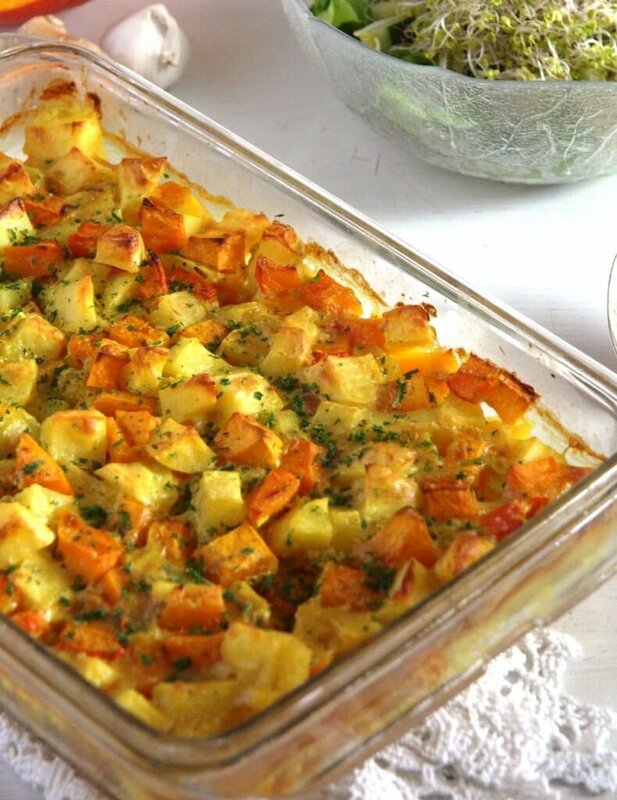 I LOVE a good potato casserole and this one sounds delicious! 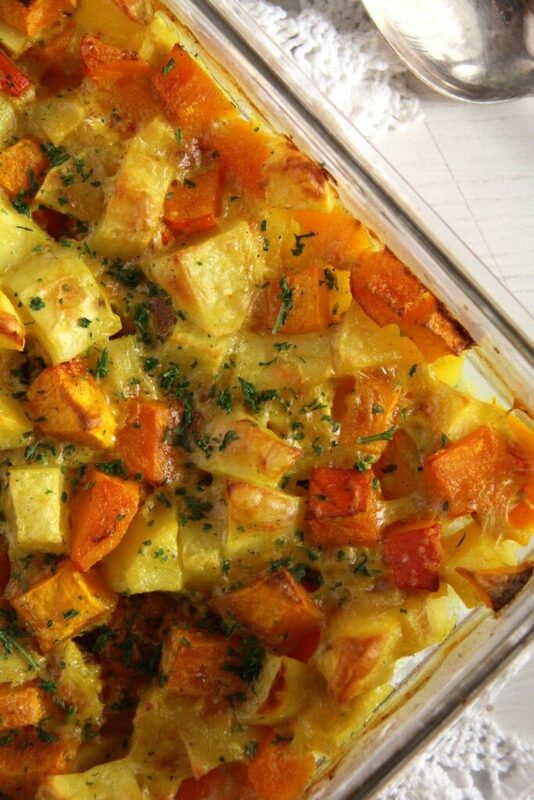 I’m totally intrigued by the potato, pumpkin and coconut milk combination! I bet this tastes amazing! Cheers, friend! I’m loving all the pumpkin dishes you’ve dished out so far!! !